One autumn day in 1966, Delores went to visit Mary Lee Hendee to see if a nice pet was available. Mary Lee showed her four month old black puppies that had been born on the fourth of July out of Ch. Inchidony Prince Charming and Ch. Cannarch Sunnyside. Delores asked to buy Canarch Yankee Patriot. 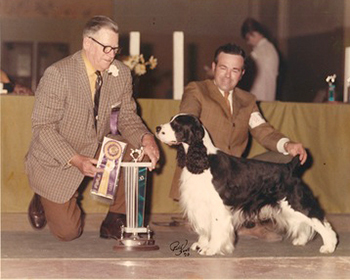 Duffy (CH Canarch Yankee Patriot CD) was not only Delores’s first show Springer, but one of her favorites. Delores put his CD title on him herself. He was patient and loving and very accepting of having her children climb all over him. He was also quick to learn and was a great show dog. He loved to hunt birds with Delores’s young sons at their summer lake home. He would swim and cruise along with the ducks until he tired.